Red States versus Blue States: Who Would Win a Civil War in the U.S? – Patrick F. Clarkin, Ph.D.
Binghamton historian J. David Hacker concluded that the number of deaths attributed to the 1861-65 U.S. Civil War, typically cited as 620,000, had likely been underestimated (Hacker 2011). Using data from the U.S. Census, Hacker estimated that there were between 650,000 to 850,000 excess male deaths during the war, settling on the middle figure of 750,000. According to the Census, the U.S. population was 31,443,321 people in 1860. Therefore, Hacker’s estimates of excess male deaths would be equivalent to between 2.0% and 2.7% of the total population at the time. Applying those same rates to today’s U.S. population of 328 million people would result in about 6.6 to 8.9 million deaths, a rather shocking total. That would be tantamount to losing the entire population of Indiana or Virginia. There is no a priori reason to assume that the rates would remain that same. One can easily imagine that things could be less or more lethal today, under different scenarios, every one of them absolutely unnecessary. These effects are more difficult to quantify, but Hacker cited historian James McPherson’s estimate that perhaps 50,000 U.S. civilians died as a result of the Civil War. There are reasons to believe that a civil war today would be much more punishing for civilians than in the past, which makes it plausible that the number of deaths could surpass the figures calculated above. In most recent conflicts around the world today (Yemen, Ukraine, Syria, Bosnia, Afghanistan, DRC, Somalia, Myanmar, etc. ), civilians are frequently harmed and sometimes deliberately targeted. Similarly, a war in the U.S. today could be more pervasive due to the more destructive weaponry and technology available than a century and a half ago. On the other hand, medicine and public health efforts are also much better than they were (though these too are often targeted in modern wars). And, as seen in the case of the Rwandan genocide, where more than half of those who died were killed by someone using a machete, advanced weaponry is not a necessary to kill large numbers of people (Verwimp 2006). So, who knows? Grimsley and Rogers concluded that all three views are overly simplistic, and that war’s effects on civilians have not been uniform over time. Instead, each episode of war should be considered as an individual case, the effects of which will depend upon local, idiosyncratic factors. This makes sense, and aligns well with my own anthropological background, which emphasizes context and historical contingency. However, given the evidence from most modern wars, it seems reasonable to suggest that the immediate effects of a civil war on the U.S. population could potentially be beyond decent contemplation. The Watson Institute for International and Public Affairs at Brown University calculated that, so far, the U.S. federal price-tag for the wars in Iraq, Afghanistan, Pakistan, and Syria is $5.9 trillion, including $1 trillion for veterans’ medical and disability services through the year 2056. This was in addition to those wars costing the lives of roughly 480,000 people – including 6,900 U.S. soldiers – due to direct war violence (and many more indirectly), and forcibly displacing 21 million people. 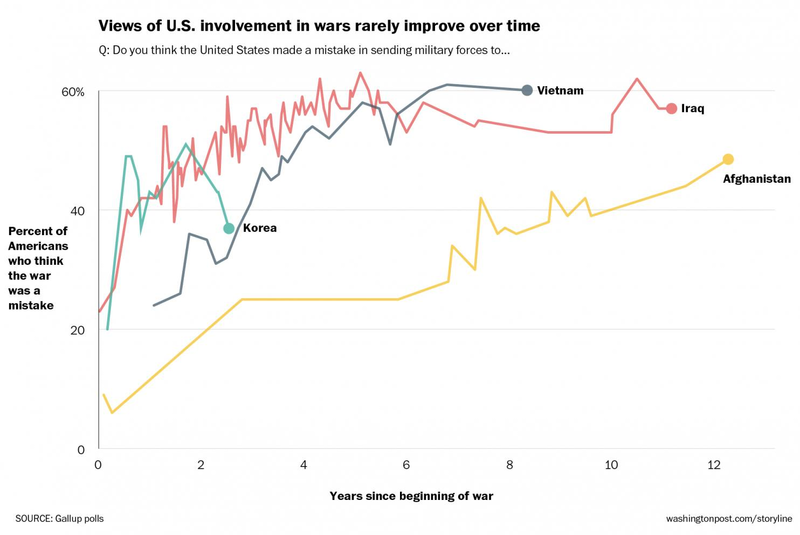 This is one example of why war has been called “development in reverse” (Collier et al 2003). Certainly, not all of that destruction can be attributed to the U.S. alone. 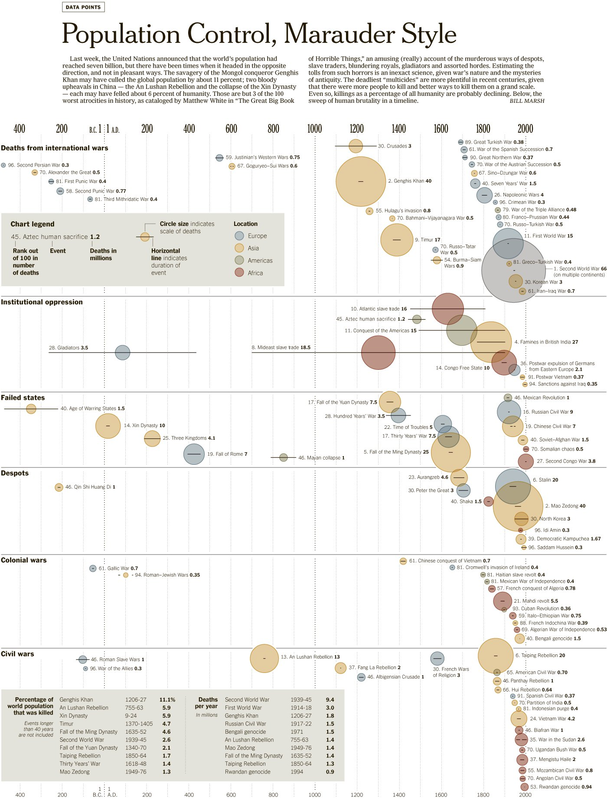 The larger point is that people often dramatically underestimate the total costs of war. And those costs are the result of fighting in other countries. How much greater would the damage be for a civil war fought within the U.S. itself? As a point of reference, the Brookings Institute indicated that the property damage from the September 11, 2001 attacks alone cost about $100 billion, with the total economic damage from the attacks totaling perhaps up to $2 trillion. A wider war in the U.S. could easily dwarf that amount. Furthermore, armed conflicts create additional costs beyond the financial ones, and beyond death and injuries alone. While it is well-known that armed conflicts inevitably increase the risks for maladies such as post-traumatic stress and moral injuries, it is less appreciated that the breakdown of social order during periods of conflict means that survivors consistently experience a suite of stressors (economic, social, ecological, psychological, nutritional) that can cause short- and long-term health to deteriorate. For example, acute malnutrition is common during armed conflict (below), as are low birth weight, growth retardation (smaller stature), and delayed maturation such as menarche. Finally, the effects do not end once a war has concluded. Consistent with the developmental origins of disease hypothesis (DOHaD), people who were exposed early in life to various conflicts such as the Dutch Hunger Winter, the Siege of Leningrad, the Biafran famine, and the Holodomor in Ukraine have grown up with elevated risks of various diseases compared to their unexposed peers (Hult et al. 2010, Lumey et al. 2015, Painter et al. 2005, Stanner & Yudkin 2001). Richard Steckel and Garrett Senney of Ohio State University (sorry, THE Ohio State University) even suggested that the Civil War could have played a role in the higher rates of cardiovascular disease in the southern United States today, generations after its conclusion. Admittedly, this is speculation. I don’t think civil war is inevitable or even likely at this point. But, sadly, it’s not impossible either. In October of last year, Niall Ferguson wrote that “the time on the civil war doomsday clock looks more like 11:08 than 11:58.” Maybe this entire essay was misguided, taking King (and others) seriously. But I wrote it anyway, in case anyone really is itching for midnight. 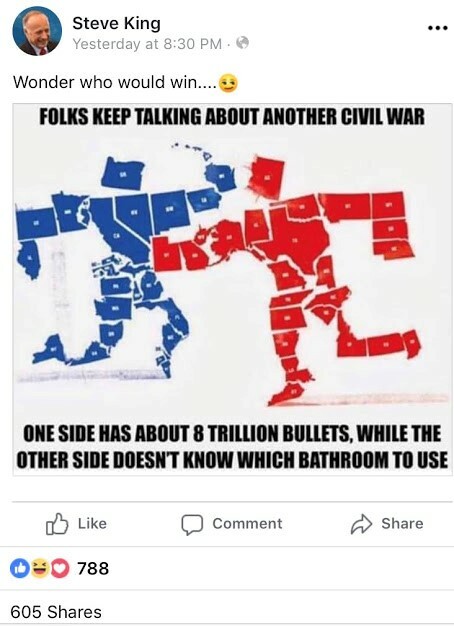 I have read other opinions that a second civil war in the U.S. would be brief. Congressman King would likely agree with that assessment, given differences in gun ownership between “red” and “blue” states, perhaps factoring in rural/ urban divisions, as well as who might control centers of food production in the U.S. But predicting the future is never easy. In April 1861, very few Americans “believed the conflict would last longer than a few months.” In the 2003 run-up to the war in Iraq, Secretary of Defense Donald Rumsfeld famously predicted: “It is unknowable how long that conflict will last. It could last six days, six weeks. I doubt six months.” And history shows that as wars go on, Americans regret them the longer they continue. When passions are high, it is fairly easy to start a war. Stopping one is another matter. Americans’ opinions of various wars over time. In sum, the only way to win a civil war is not to engage in one. Yes, people are angry. They’ve been fed a steady diet of outrage for years, and they’re certain the other side is wrong, likely corrupt, maybe evil. But as Adrienne Rich wrote: “War is an absolute failure of imagination, scientific and political.” It is not a scalpel that can easily excise an unwanted segment of a population. It is a sledgehammer, a mad bull that lost its way. Remember that while it is easy to dichotomize states into red and blue, this belies the more complex reality of local variations of purple that fluctuate over time. Enemies can become friends and vice versa. When wars end, after all the pain and destruction, people have to live with each other again. So let’s skip all that mess and figure out something else. Grimsley M, Rogers CJ. 2002. Introduction. In Civilians in the Path of War. Grimsley M, Rogers CJ, eds. Pp. ix–xxvi. Lincoln: University of Nebraska Press. Link. This entry was posted in Cooperation and conflict, War and health and tagged Civil War. Bookmark the permalink.